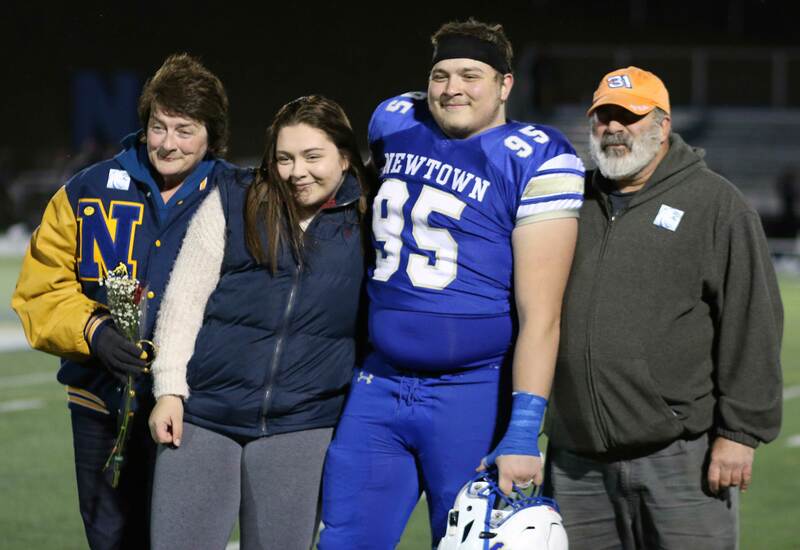 (Newtown CT) Everything favored a big Newtown win. The respective records; Newtown 9-0, Masuk 5-4. 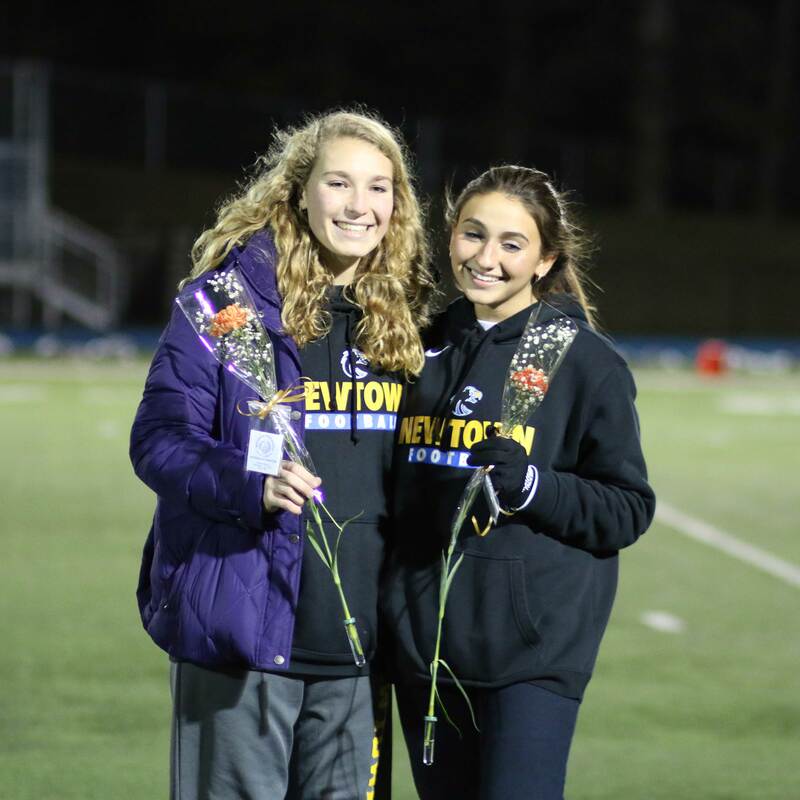 Experience; Masuk had two returning starters. 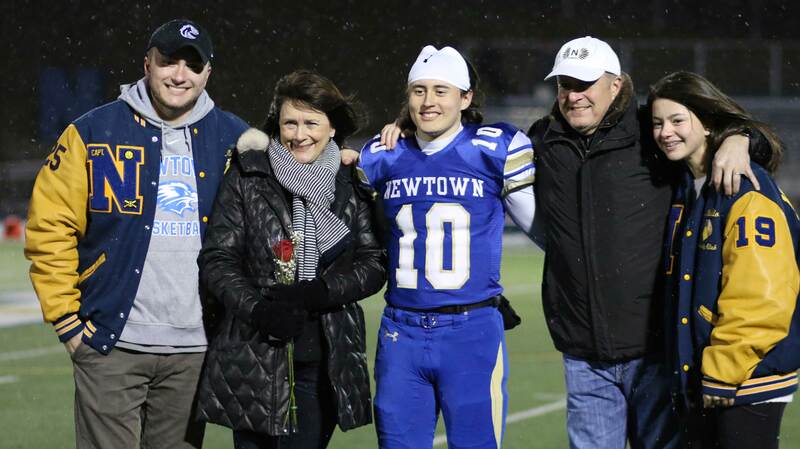 But it turned out to be a surprisingly close game won by Newtown, 21-14, on a chilly Wednesday night at Blue-and-Gold Stadium. Newtown built up a two-score lead late in the third quarter but were seriously threatened in the final quarter. MHS narrowed the margin to one score with ten minutes left and nearly tied the game five minutes later. But on this uncomfortably cold evening the home team had the defensive goods to withstand the challenge. With the victory, the Hawks (10-0) finish an undefeated regular season and are heading for the playoffs. 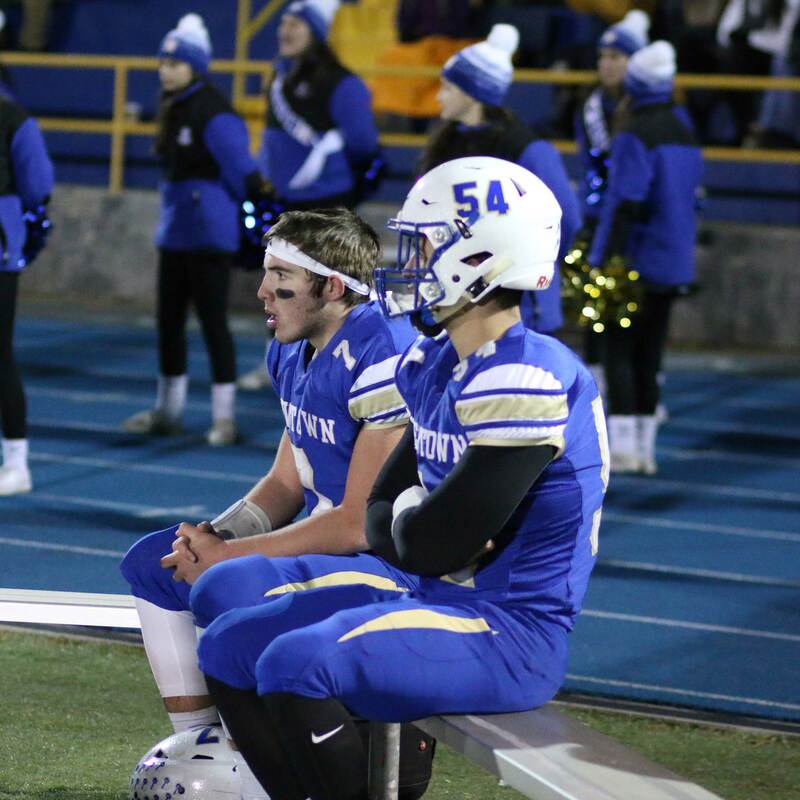 However, much of the chatter afterwards was about Masuk’s play in the losing effort. 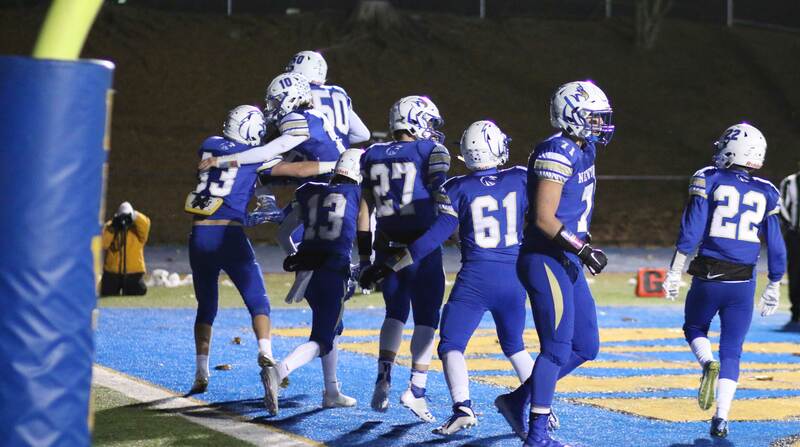 The Panthers (5-5) pulled off numerous long gainers and found ways to hold Newtown to only three touchdowns. That “only” makes a little more sense when you realize that Newtown came into the game averaging forty-five points per outing. 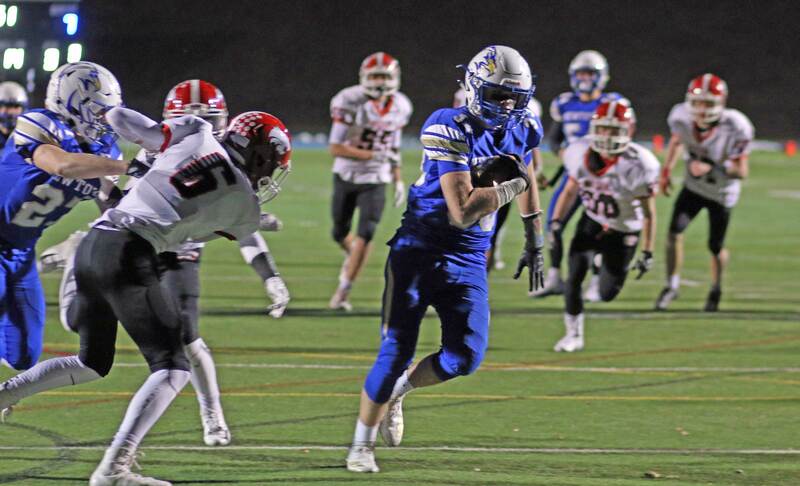 A big run by Dan Mason (126 yards, 1 touchdown) on Newtown’s opening possession put the Hawks deep into Masuk territory. NHS ended up with a short yardage 4th down on the M21. Quarterback sneak made sense and that was the play. 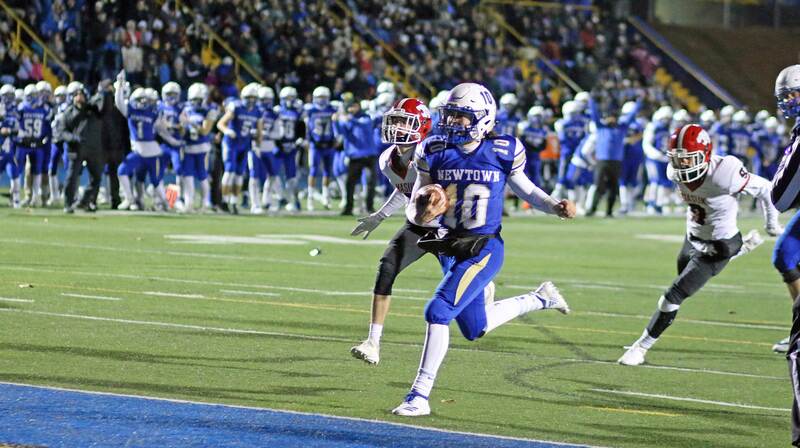 Newtown QB Luke Mellilo hit the middle and looked wrapped up, but suddenly broke loose and off to the end zone he went. Devin O’Connell kicked the extra point. Newtown 7 Masuk 0) – 8:52. I must admit that, based on the records, I thought that this was the beginning of a long night for the visitors. Consider me wrong on that one! My inclinations didn’t change right away. On Masuk’s first possession, they fumbled (Kevin Luke recovered for Masuk), and struggled to move the ball. But suddenly that changed on a harmless side-pitch to Dan Verastro on the right. There looked to be plenty of Newtown defense in the area but that didn’t matter as Dan cut to the middle and then to the outside. Off he went for a 44-yard touchdown. Nolan McCarter kicked the extra point. Newtown 7, Masuk 7 (6:34). 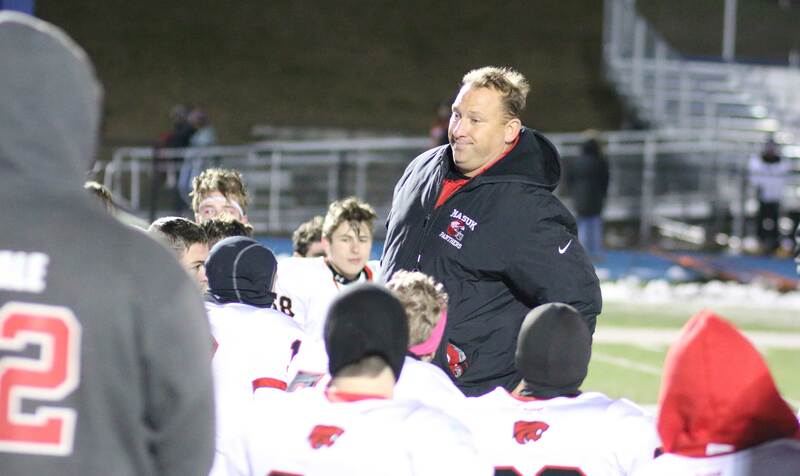 I think that that touchdown alerted Masuk that they could play with Newtown and told the Hawks that the Panthers wouldn’t be going easily into the frigid night. And that was the way it went. Newtown regained the lead in the second quarter. Senior Dan Mason, who mainly pounds away in the middle, swept left and got a step on everyone. Dan Verastro was able to run Dan down at the Masuk two. Dan Mason, who had two TDs last Thanksgiving, covered the final two yards up the middle. Newtown 14, Masuk 7 (5:30). The Hawks tried two field goals during the remainder of the half. The second Devin O’Connell attempt, with one second left, led to one of the most exciting plays of this game. The attempt was blocked, and the kick floated to Masuk’s Ian Jackson at the one-yard line. Ian started right and then changed his mind and went left. I was in the end zone behind the runback and Ian had at least five blockers in front of him as he headed up the field. 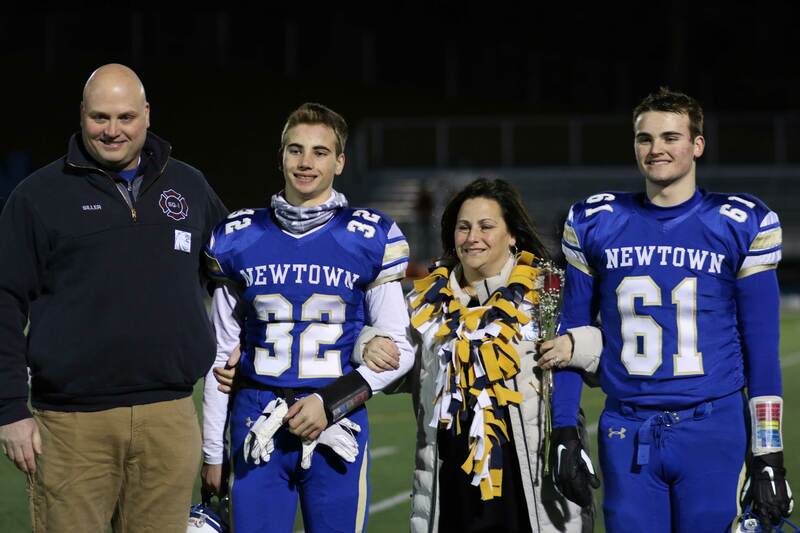 Fortunately for Newtown, one of their players caught Ian at midfield to end the half. 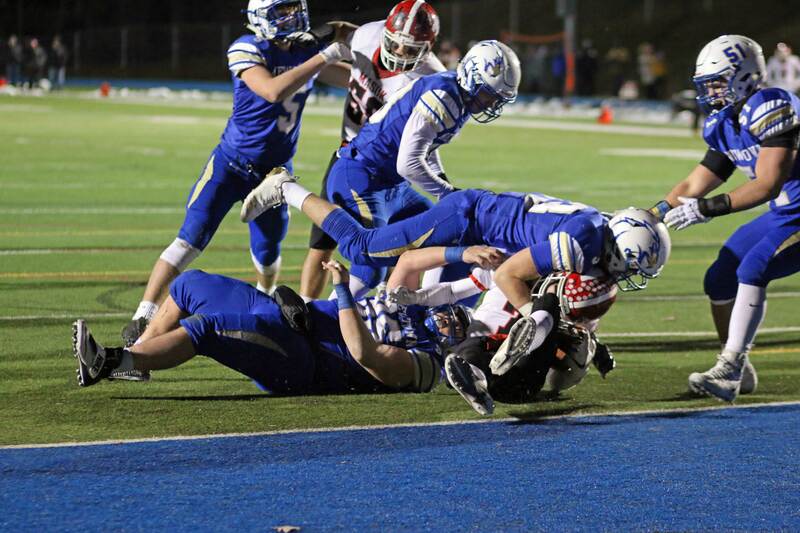 In the third quarter, a 4th down gamble by Masuk failed but Newtown couldn’t capitalize. 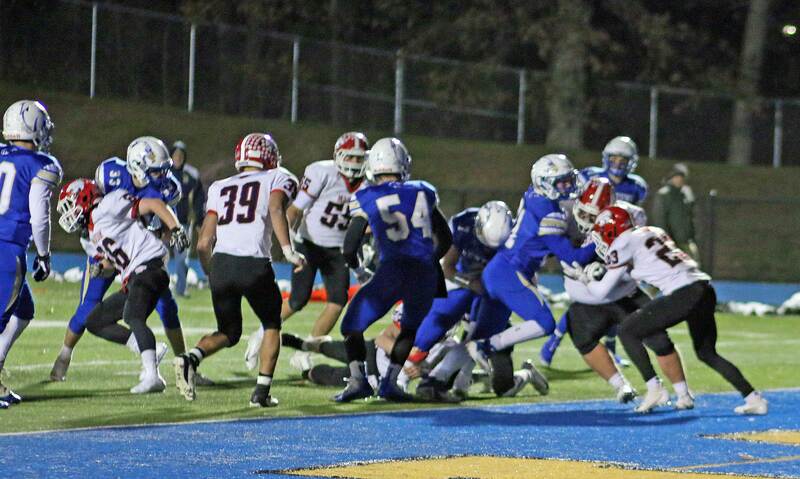 Later, a Masuk fumble was recovered by Jared Dunn on the Masuk 29. 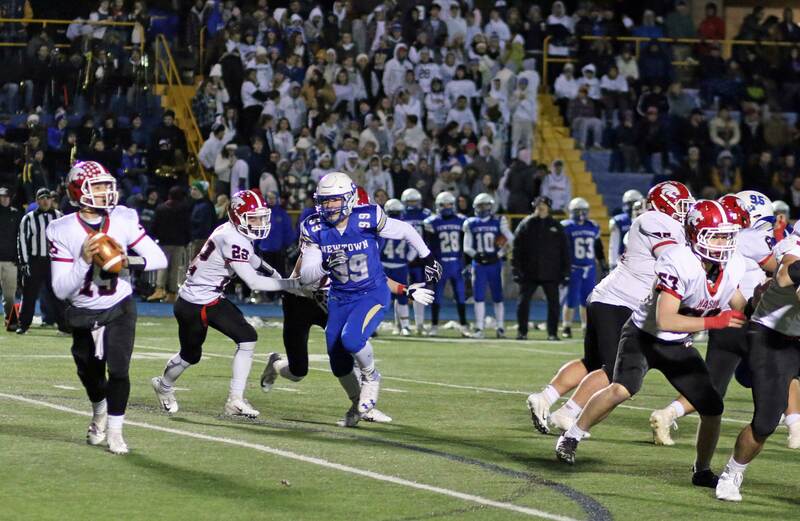 A tough Masuk holding penalty moved NHS closer and Jared covered the final fifteen yards up the middle. Devin O’Connell kicked the extra point. Newtown 21 Masuk 7 (2:47). I have to admit that at this point, down by two touchdowns, I thought that the wheels were finally off of Masuk. Into the 4th quarter we went and a wind-blown punt (Jack Mulligan) pinned Masuk deep. 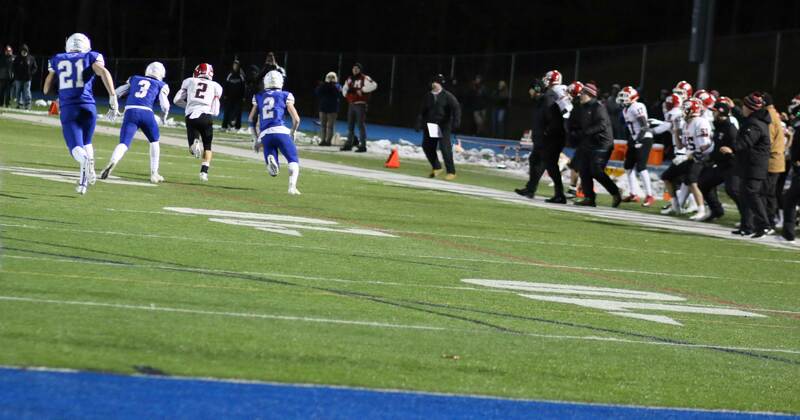 Then there was a near-safety as Kevin Luke barely escaped the end zone. Once again, Masuk, given up for dead, was far from it. 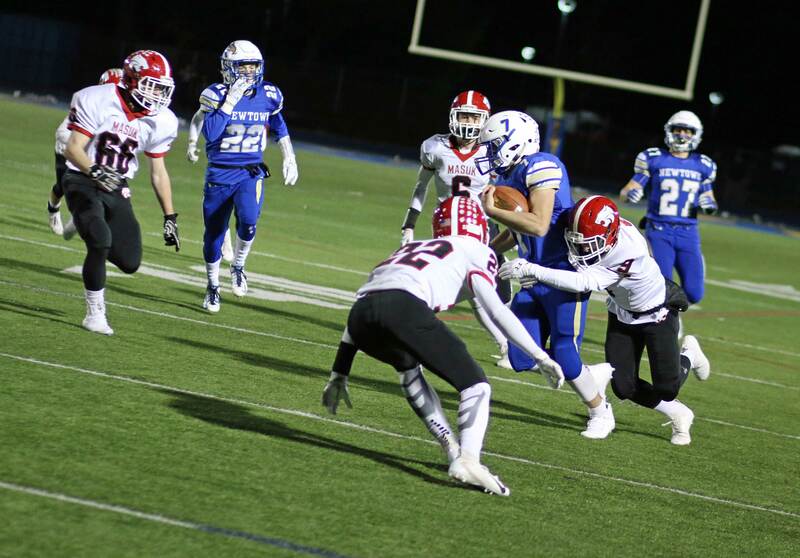 Senior Thomas Juliano stood in the end zone and had the arm and accuracy to get a throw to Chris Tillotson behind defenders Joe Paggett and Will Swierbut. It was a footrace to the other end won by Chris. Noel McCarter kicked the extra point. Newtown 21 Masuk 14 (10:05). Plenty of time for the Panthers but this was where the Hawks showed me why they have been so successful this season: defense. 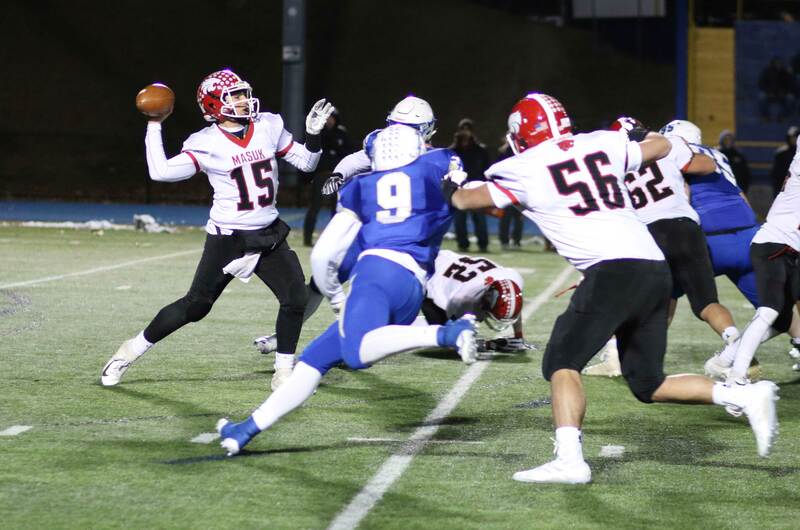 “I think we had some more big plays left but we never got to them,” said MHS coach Joe Lato. “It was our defense that won the game,” surmised Matt Dubois. And who could argue based on what Newtown did over the final ten minutes of the game. I recall three Masuk possession in the last six minutes. 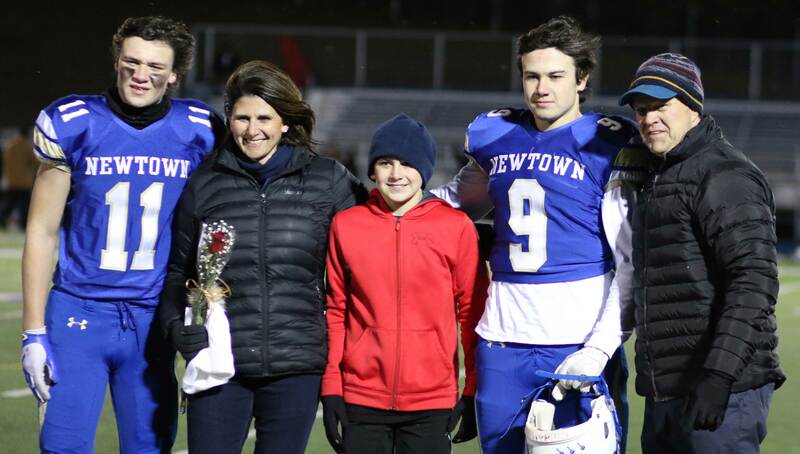 Each ended with standout Newtown defense. 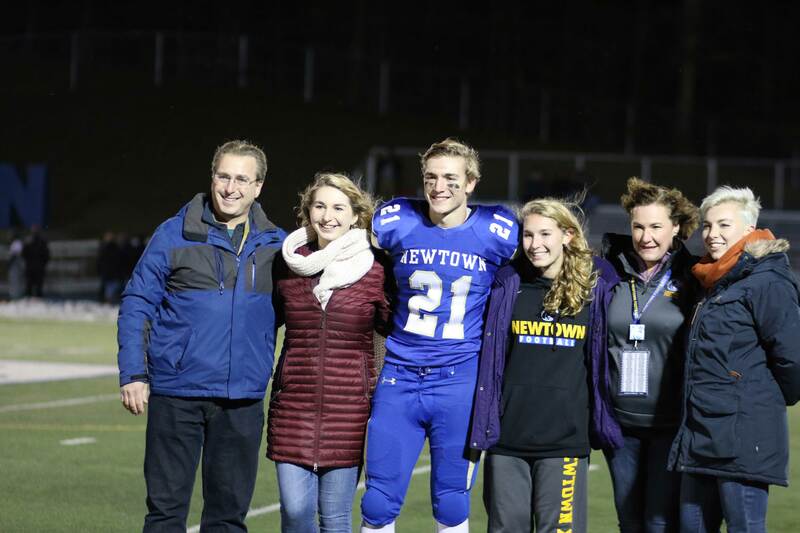 Will Swierbut caught up to Henry Minnick who had gotten behind the Newtown defense and saved a TD. 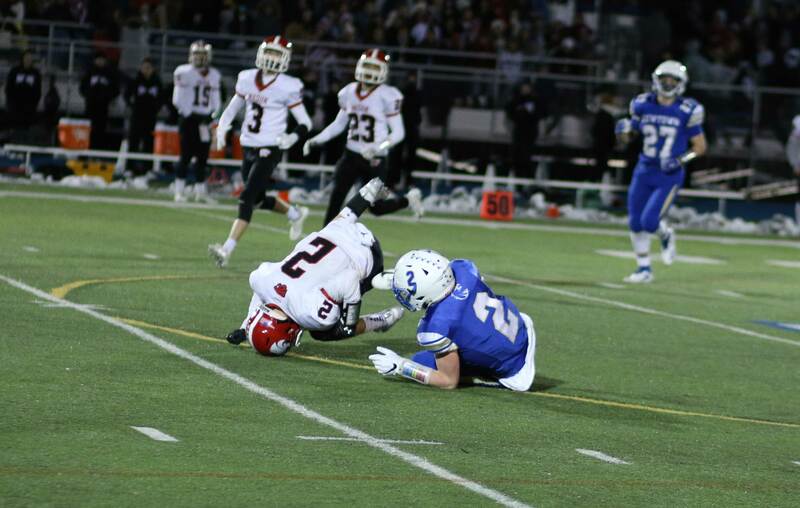 Zack Loomis sacked QB Thomas Juliano on 4th down at the Newtown 20. 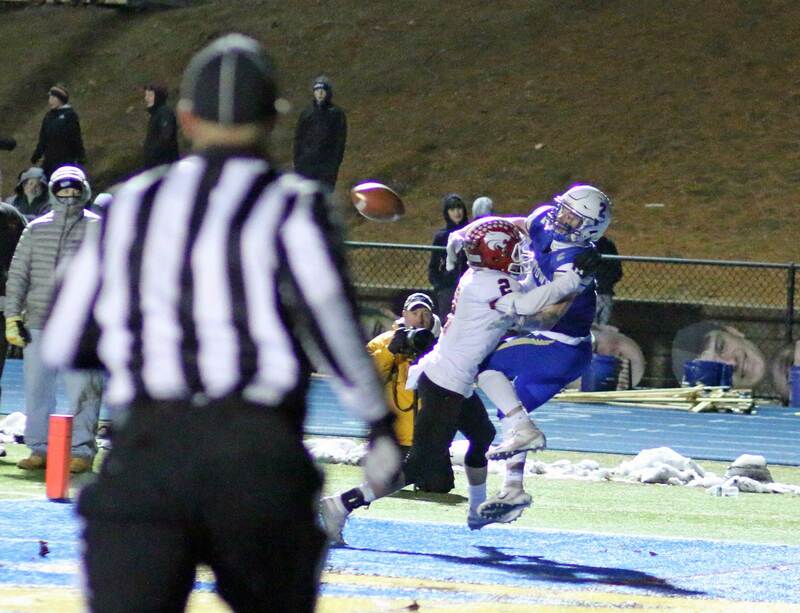 Joe Paggett intercepted a Masuk pass in the closing minute to end the Panthers final possession. The Hawks had only given up thirty-four points all season and their late-game big plays showed how they were able to do that. 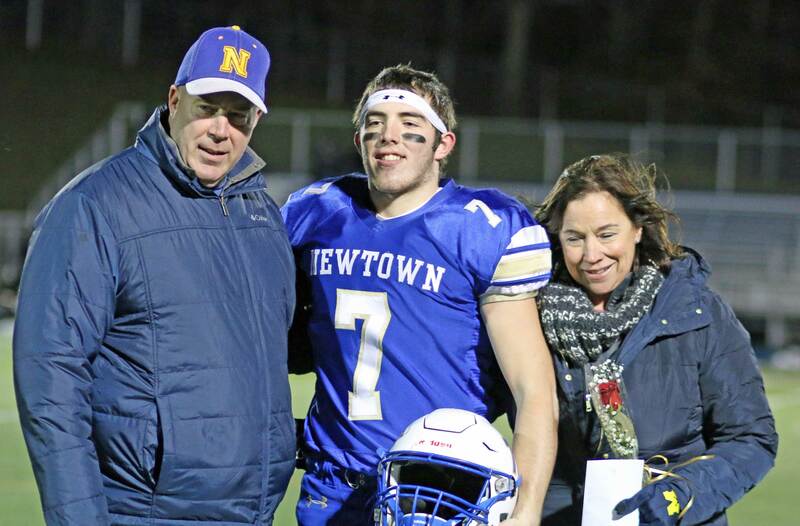 “Our defense had some big stands at the end,” recalled Newtown coach Bobby Pattison. 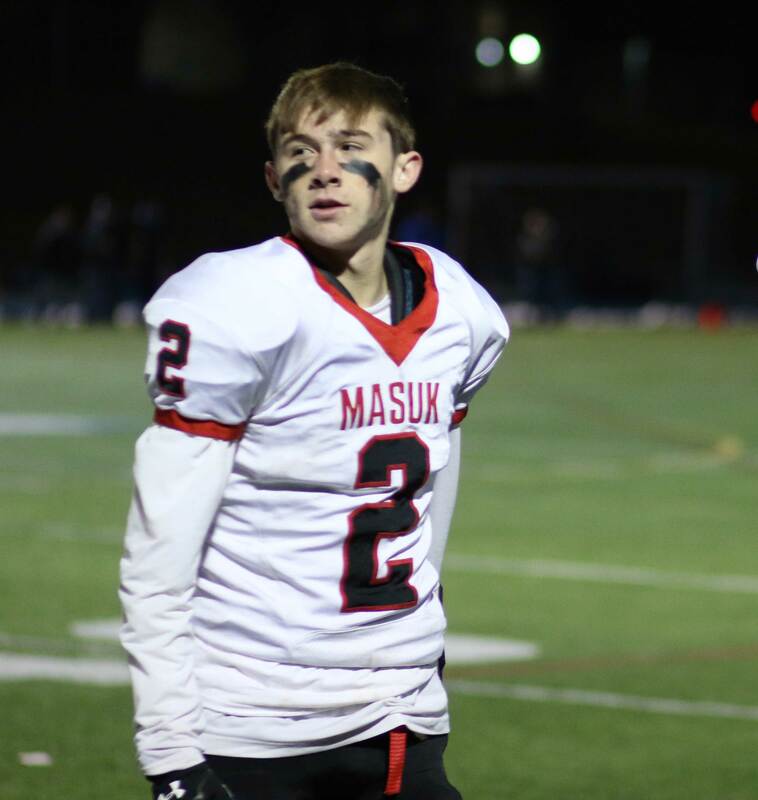 Masuk reached the Division L championship game last season. College plans? 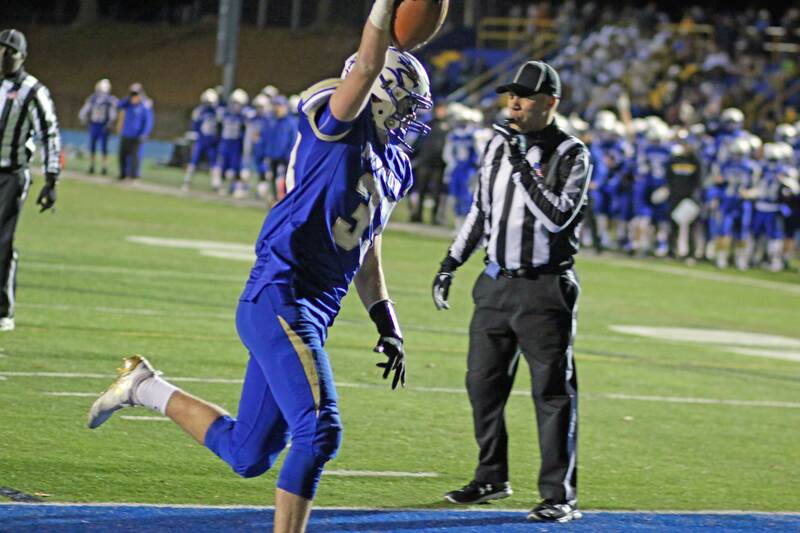 Matt Dubois: “I am going to go to Johns Hopkins (Baltimore MD) to play football. They’re a good program and are in the playoffs now. I visited in the spring and liked it.” Matt told me he was uncertain as to what courses he’ll take. He was looking forward to joining the Blue Jays in 2019. 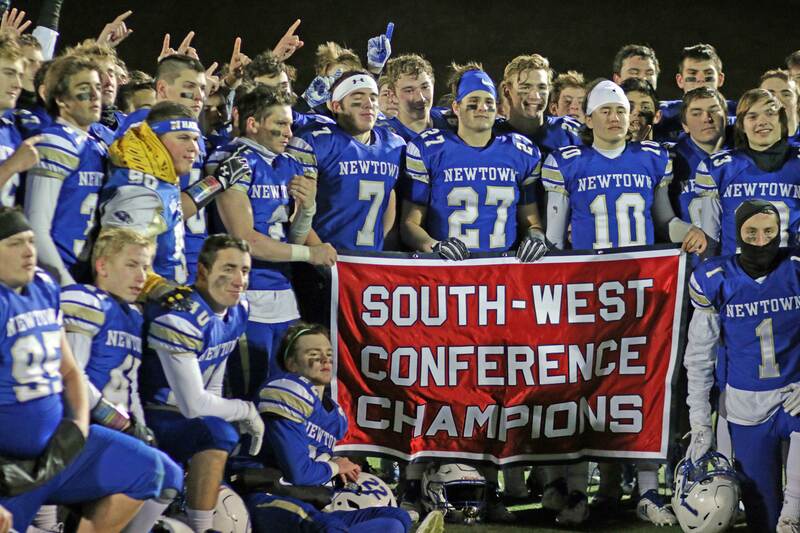 Newtown has won the South-West Conference seven straight times and they have the same number of consecutive wins over Masuk. 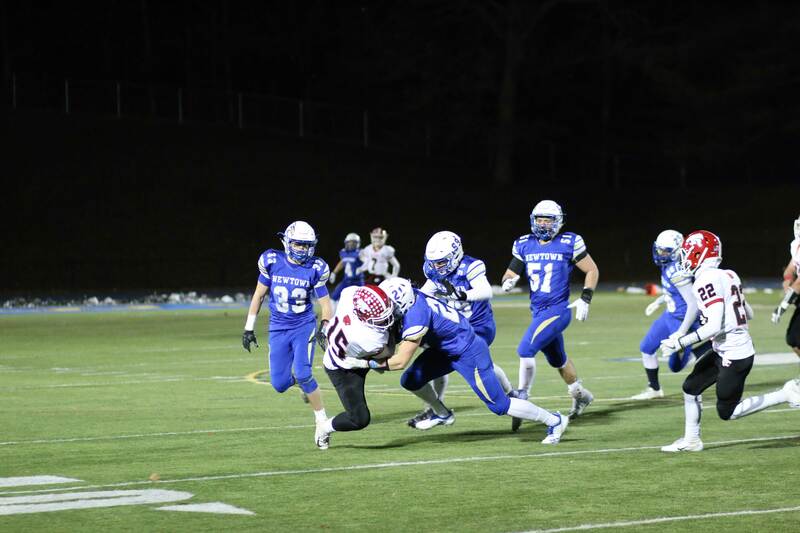 Dan Mason finished the regular season with 1196 yards rushing and 27 touchdowns. Many folks helped clear the stadium of snow after the November 15th storm. 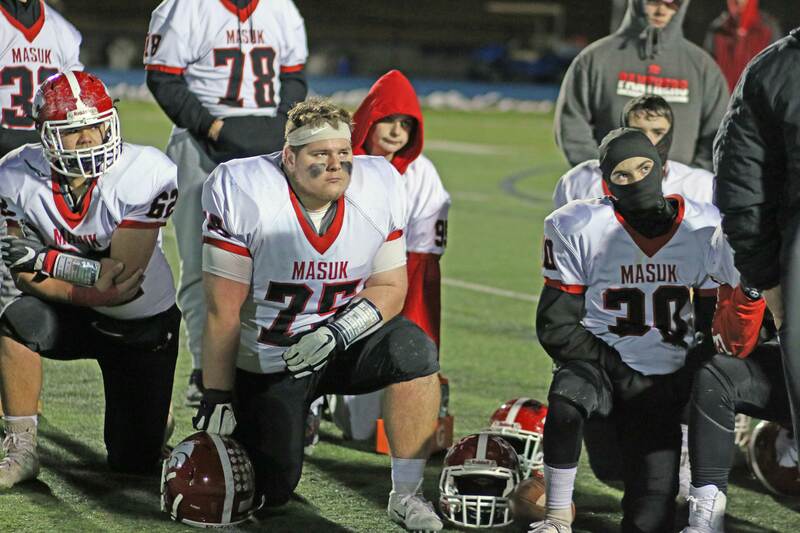 Noticed that a lot of the snow was piled on the Masuk sidelines. Good lighting at Blue-and-Gold but the cold breeze was tough. The post-game clearout was almost a stampede!